MISSION, KS--(Marketwired - Apr 18, 2014) - (Family Features) Kabobs are a simple way to enjoy many of your favorite fresh flavors in a single meal. With their easy preparation and quick cooking time, kabobs make a perfect weeknight meal when served over rice along with a crisp salad. The potential combinations of meat, vegetables and fruit on a kabob are nearly endless. Spring/summer varieties of onions are especially well-suited for kabobs. Their flavor ranges from sweet and mild to slightly pungent. Easily identifiable by their tissue thin skin, spring/summer onions are higher in water content, which gives them a tender crisp texture when grilled. 1. Chill onions at least 30 minutes before cutting, and use a sharp knife to reduce tearing. 2. Soak onions in ice water overnight to dampen their flavor, yet keep their crisp, juicy texture. 3. Cut onions can be refrigerated up to 7 days in sealed containers. Before you begin experimenting with kabob combinations of your own, try this deliciously simple recipe, which melds chicken and shrimp with two colors of onion, bell pepper and mango for a sweet and savory main dish. Remember to cut ingredients into uniform pieces and leave space between each piece to ensure your kabobs cook evenly and thoroughly. Find additional recipes at www.onions-usa.org. Place chicken and shrimp in shallow glass pan or large re-sealable plastic bag. For marinade, combine oil, chutney, teriyaki sauce and vinegar in small bowl with lid. Pour half of marinade mixture over chicken and shrimp. Cover or seal and marinate in refrigerator at least 3 hours, preferably overnight. Cover and refrigerate remaining marinade for basting. If using bamboo skewers, soak in water at least l hour before using. To prepare kabobs: Drain and discard marinade from meat. 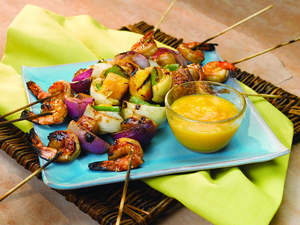 Thread chicken, yellow and red onion, mango, green pepper and shrimp alternately onto skewers. Be sure to keep enough room at one end of each skewer for a "handle." Coat grill grate with nonstick cooking spray. Place skewers over medium coals, and grill for 12 to 15 minutes or until meat is done and vegetables are tender. Brush often with reserved marinade and turn skewers until cooked through. If needed, use spatula to gently loosen skewers before turning as they may stick. Arrange skewers on a platter and serve with Ginger Mango Dipping Sauce. Combine ingredients in electric blender and puree until smooth. Alternate preparations: Omit shrimp and use 1 1/2 pounds boneless, skinless chicken breast, cutting into 36 cubes and using 2 per skewer. Instead of grilling, place kabobs in broiler pan coated with nonstick cooking spray and broil 3 inches from heat about 10 to 15 minutes or until done, basting and turning as needed.